Trader Hotel Kuala Lumpur is no stranger to the elites when it comes to fine pleasures of food and travel. Nestled in the heart of our metropolitan city, the hotel has always been known for their fine rooms that comes with gorgeous city scape views as well as delicious dining in all their restaurants. And how can we not mentioned that amazing award-winning SkyBar that overlooks our majestic Twin Towers from its cabana booths! While I have been to Gobo Chit Chat at Trader Hotel Kuala Lumpur that offers delectable buffet dining as well as ala carte menu, there’s another that offers steaks grilled to perfection at Gobo Upstairs Lounge & Grill. 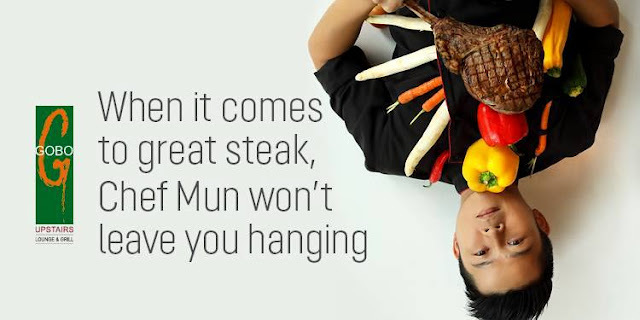 Introducing their new sous Chef Fun Keng Mun on board, diners are certainly in for a treat of sumptuous menu in a cozy and stylish ambiance set with a backdrop of our amazing city view. Better known as Chef Mun, the young but talented chef exudes exceptional culinary skills in preparing a feature of his signatures that evening for members of the media and bloggers. Chef Mun’s menu was further elevated with pairings of Chilean Vina Maipo wines. Diners sampled courses from Amuse Bouche to main courses as well as dessert and cheese course paired with various wines that evening. 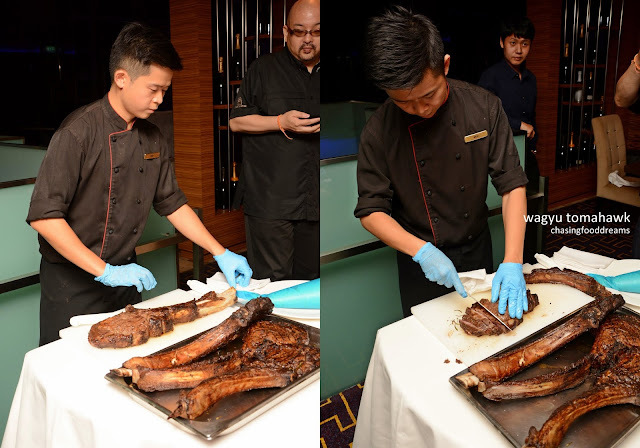 Chef Mun also featured one of the finest culinary pleasures for meat lovers with a Wagyu Tomahawk that will certainly make one gawked in pleasure at sight! Vina Maipo Vitral Chardonnay was served to be paired with our starter courses. The pale lemon yellow Chardonnay is a perfect complement to the various starters with its fresh fruity notes, enhancing the seafood courses well. GUP Cold Platter was a sampling platter of Gobo Upstairs starter menu. Offering a trio of Vodka Cured Salmon, Spanish Mackerel Tartare & Wedge Salad 6, this cold platter of starters awakened our palate with much freshness and lightness. The Vodka Cured Salmon was salty and umami notes of pleasure with crunchy asparagus and creamy crème fraiche with caviar. The Spanish Mackerel Tartare was tangy and almost briny, cleverly offset with preserved lemon yoghurt. A small mount of iceberg lettuce with blue cheese, crispy beef bacon with goddess dressing summed up Wedge Salad 6. Moving on to the GUP Hot Platter, this one showcased hot starters from the menu. From Salmon Crab Cake to Crispy Prawn Durian Mayo and Balsamic Tuna, this platter of hot bites received positive feedbacks from our table that evening. If I have to select a favorite, it would have to be the Salmon Crab Cake for its crispy shell filled with sweet chunks of crab meat and salmon. The Crispy Prawn Durian Mayo won many delicious votes for its boldness of golden crispy prawns paired with an unusual durian mayo. Lightly seared Balsamic Tuna is elegantly paired with smoked eggplant that echoed delicate and tasty flavours of the much-beloved tuna. The next soup course was paired with Vina Maipo Vitral Merlot, a red with fruity stone fruits and silky tannin with a long finish. Our soup course was a celebration of the king of crustaceans with Lobster Bisque. The bisque hit all the right notes of comfort flavours. Silky, thick, creamy and redolent of prawn and lobster infused with brandy, the bisque also had bits of lobster meat and tarragon cream to elevate the flavours sinfully. Superb! Main courses arrived, starting with Baked Cod with Miso Honey paired with our earlier white wine of Vina Maipo Vitral Chardonnay. Smooth and sweet cod was cleverly paired with an unusual miso honey sauce, complemented by chargrilled romaine lettuce, crispy tofu cubes and wasabi. Flavours are subtle and yet tasty with the cod being the star of the dish. Moving on to meaty main courses, Pampas Del Sur Estilo Malbec was lush with dark rich forest fruits. Medium bodied, this red proved to be a well-matched for the lamb and beef. Grilled Lamb Loin had sliced lamb loin paired with a golden arancini ball, broccolini and porcini sauce. While my lamb loin was a tad too cooked for my liking, others had no issue as theirs were cooked to lovely medium pinkness. The porcini sauce is so yummy and made up for the lamb while the arancini rice ball is also very delicious. The limelight of the evening was when Chef Mun brought out these amazing humongous rack of Wagyu Tomahawk and sliced it in front of our eyes. Literally, its hard not to gawk as these tomahawks looked utterly ravishing with its chargrilled edges and delectable aroma. Chef Munn certainly did justice for these giant tomahawks. As he sliced the wagyu tomahawks, everyone was practically salivating at sight of this amazing hunk of beef. An order of Wagyu Tomahawk is about 1500gm, great for sharing as it comes with mashed potatoes and seasonal vegetables. Priced at RM820, the tomahawk is truly a masterpiece of beef that is worthy of its hefty price tag. Well-seasoned and also sprinkled with crushed pink peppercorns to finish, the slices of Wagyu Tomahawk were utterly sublime in flavours and textures. We enjoyed this sans the sauce as the beefy flavours were exceptionally tasty. Needless to say, it’s my favorite dish of the evening by Chef Mun! Dessert was also an interactive show stopper with Cherry Bommm. As if a sweet dessert is not enough to end the meal, Chef Mun brought out a plate of Raclette with Ham, Potatoes & Rocket. Hot off the wheels of the raclette, he cleverly shaves of the melted unctuous cheese and piled it onto roasted potatoes with some shaved bologna and crisp rocket leaves. The aroma is literally heavy with an unctuous aroma that reminded me of our local salted fish. It may be a tad strong in aroma but the salty flavours of the cheese is definitely a yum plus point in my books. 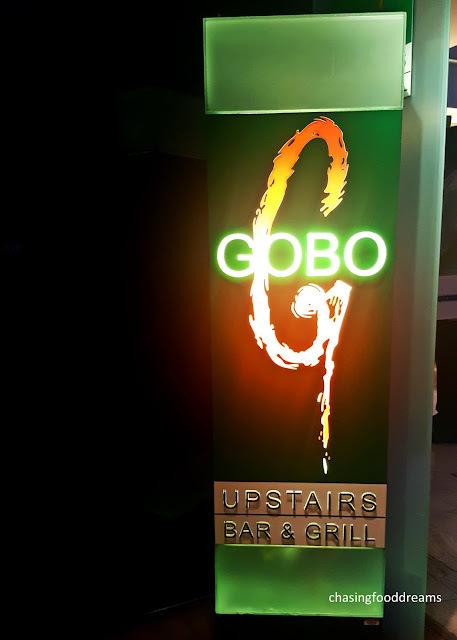 For reservations, please call 603 2332 9910 for more information.